Matt Ellis will be back in the blue and gold for another year after agreeing to terms on a one-year deal with the team. According to CapGeek he will earn $625,000 this season. Matt Ellis will be back with the Sabres for the 2010-2011 season. The signing is a testament to Ellis’ work ethic and drive, not his stats. He has been with the Sabres since 2008-09 and has been one of the most consistent workers on the roster in the span. However, the signing is rather surprising since it seems as if the team has all the forwards they need, and then some. Tim Connolly, Paul Gaustad, Derek Roy and Rob Neidermayer are the likely centers while there is a wealth of players on the wing. Thomas Vanek, Jason Pominville, Jochen Hecht, Mike Grier, Cody McCormick, Tyler Ennis, Nathan Gerbe, Drew Stafford, Pat Kaleta and Mark Mancari all figure to battle for spots as they enter training camp. Vanek, Hecht, Grier, Kaleta, Pominville and Stafford are all likely locks while Tyler Ennis’ strong close to 2009-10 and Nathan Gerbe’s big numbers in the AHL make them strong candidates. Mancari is destined for Portland, or a trade and McCormick seemed to fit well during his call-up in the playoffs. Vanek-Roy-Stafford/Ennis-Connolly-Pominville/Hecht-Gaustad-Grier/McCormick-Neidermayer-Kaleta. That makes Ellis or Gerbe your 13th forward. 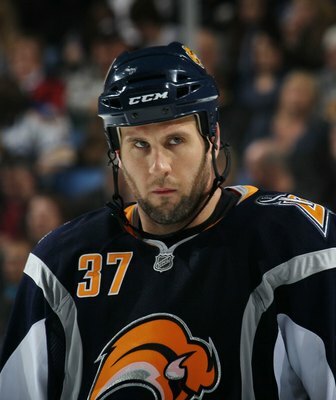 So, maybe Ellis stays with the big club while Gerbe gets big minutes on the farm. Or vice-versa. Gerbe could get a season in the bigs while Ellis goes to Portland and acts as a mentor to the Sabres prospects. The least likely scenario is a trade. So many fans have been down on Tim Connolly and Drew Stafford lately and I doubt Gerbe’s staying power in the NHL, despite his raw talent. By moving any one of those three, or a combination of them, you free up space for Ellis or Gerbe (if he isn’t moved). Once training camp rolls along I feel that a clearer picture will be painted. There is likely to be some fierce competition for the final few spots, I’m especially interested to see what Gerbe, Ennis, Ellis and McCormick do to cement their spot on the opening-night roster.